A house that's for sale on a land contract in Detroit. It's common for a house to need a gut rehab. This is the third in a three-part series on the Detroit housing market. Read part one, on the city's residents who rent from faraway buyers, and part two, on why mortgages have all but disappeared from the city. Eddie Cave spends a lot of time in front of his house in his electric wheelchair, which is connected to a generator in the back. He’s had a couple of surgeries on his knees recently and uses an oxygen tank for a respiratory condition. He props his leg up as he sits and watches his quiet, grassy block on Detroit’s west side. “Everyone in this block gets along, we try to keep it as clean as we can,” he said. Eddie, 57, and lives off disability payments. He bought this house a couple of years ago for just $2,500, payable on what’s called a land contract, a loan from the seller. It works a lot like rent-to-own: the person or company selling the house draws up a contract, the buyer makes a down payment, moves in and makes remaining payments directly to the seller. Land contracts usually carry much higher interest than a normal mortgage, and they are not regulated in the same way because most land contracts aren’t reported to county or federal regulators. Unlike traditional mortgages, land contract loans are often made without an appraisal on the house, or a credit check on the buyer. Eddie grabs his walker so we can go inside and look. The floors are dark wood, the walls painted a deep blue. It’s a classic Detroit two-story, regal but run-down. Before he moved in, scrappers had stripped the furnace, the electric wiring and the bathroom sink. He started replacing the windows and patching the leaks in the roof, but in the middle of that process, he started having to use the wheelchair more regularly and had to stop. He uses kerosene heat in the winter; in the kitchen, the only appliance is a camp stove set up in the middle of a cracked linoleum floor. The dining room table is lined with gallon bottles of water. Here’s the catch: Eddie Cave still doesn’t actually own this house. There was some fine print in the contract he signed with the sellers, specifying that he would be responsible for all of the unpaid taxes on the house. They said the tax bill would be $1,400 dollars, and it turned out to be even more. “I let them know that I couldn’t do it, but they wanted it anyway,” Cave said. He’s been in a prolonged legal battle with the sellers, a local property agency that is listed as Joy Management, Acorn and Action Real Estate on various documents. The sellers didn’t respond to multiple requests for an interview, but they did get their money: a local community organization bought out Eddie's contract, and he's now repaying that organization rather than the buyers. In Detroit, it’s common knowledge that there’s very little mortgage lending going on: most home sales happen in cash, with a small minority taking place either through traditional mortgages or land contracts. "I have not seen one land contract in the city of Detroit that was good,” said Charlene Snow, a lawyer in Detroit’s bustling landlord-tenant court. She says she’s been seeing more and more cases like Eddie Cave’s, where sellers try to evict would-be buyers over back taxes or one missed payment. In effect, the people trying to BUY the house have the responsibilities of an owner, with less protection even than a renter. “[They pay] high rent on a home that’s a piece of crap and uninhabitable, until they make all the repairs,” Snow said. There are reports of similar deals from all over the country, especially in places hard-hit by the housing crisis. In a study of land contracts in Atlanta, the National Consumer Law Center found land contracts are especially common in communities of color, and often leave buyers with few protections. And The New York Times has reported federal regulators are beginning to take an interest in these transactions. 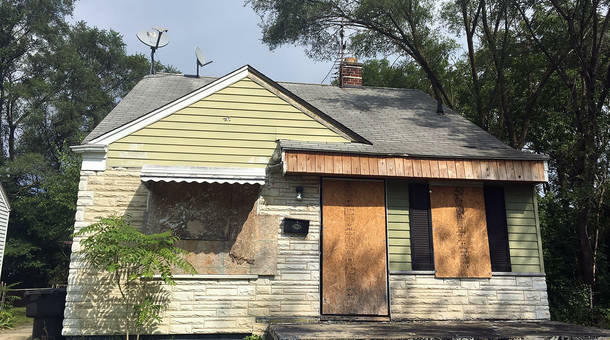 In Detroit, land contracts are essentially a way around lending rules: a lot of people have bad credit, or the houses are so messed up, traditional lenders won’t accept them as collateral. Investors who have cash can buy low and jack up the prices, then either rent the homes out, or “sell” it on a land contract--sometimes multiple times over. Sonny Mandou argues it’s often still a good deal for the buyer: he’s a real estate broker in Detroit. “Come to the table with three thousand dollars and walk away with the deed to a house...there’s nowhere else in the world you can do that,” he said. And he thinks sellers don’t really have a choice but to offer land contracts in markets like this, though he also admits it can be a way for investors to just dump a bad investment, back taxes and all. Still, contract sales often target the most vulnerable--and offer them little protection once the contract is signed. Once he has his home paid off, and figures out how to get a new furnace, Eddie Cave wants to use his energy helping other people avoid getting taken advantage of.